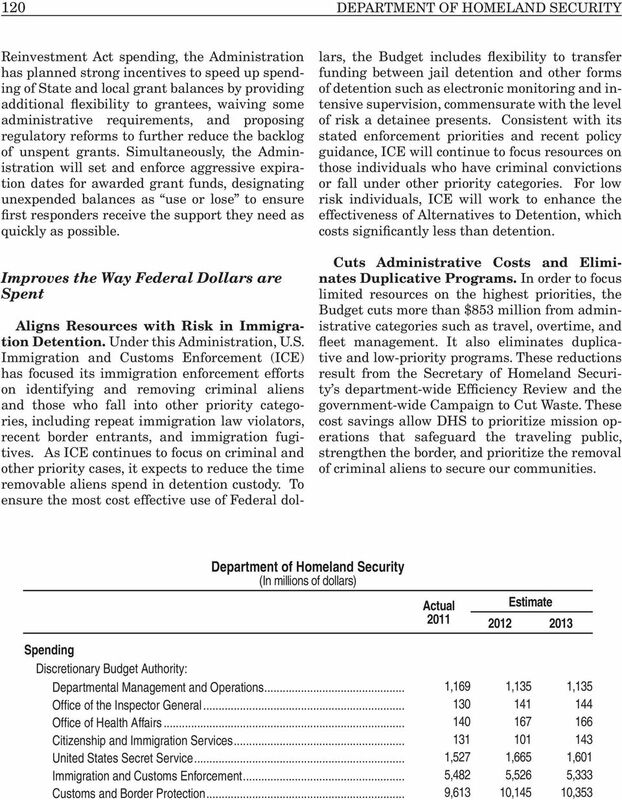 Download "DEPARTMENT OF HOMELAND SECURITY"
5 THE BUDGET FOR FISCAL YEAR Department of Homeland Security Continued (In millions of dollars) Actual 2011 Estimate Transportation Security Administration... 5,384 5,425 5,106 Federal Law Enforcement Training Center National Protection and Programs Directorate... 1,165 1,214 1,217 United States Coast Guard... 8,622 8,656 8,319 Federal Emergency Management Agency... 7,155 4,246 4,528 Science and Technology Domestic Nuclear Detection Office Subtotal, Discretionary budget authority... 41,885 39,649 39,462 Discretionary Changes in Mandatory Programs (non-add in 2012): 1 Citizenship and Immigration Services Total, Discretionary budget authority... 41,885 39,649 39,458 Discretionary Cap Adjustment: 2 Disaster Relief... 6,400 5,481 Overseas Contingency Operations Total, Discretionary outlays... 47,474 58,845 54,884 Mandatory Outlays: Citizenship and Immigration Services... 2,386 2,928 3,059 Customs and Border Protection... 1,017 1,659 1,634 United States Coast Guard... 1,838 1,465 1,694 Federal Emergency Management Agency... 1,296 1, All other... 5,653 5,840 5,950 Total, Mandatory outlays... 1,708 1, Total, Outlays... 45,766 60,455 55,357 Credit activity Direct Loan Disbursements: Disaster Assistance Total, Direct loan disbursements The 2012 amounts reflect OMB s scoring of the 2012 Appropriations acts (P.L and ) as transmitted to the Congress. 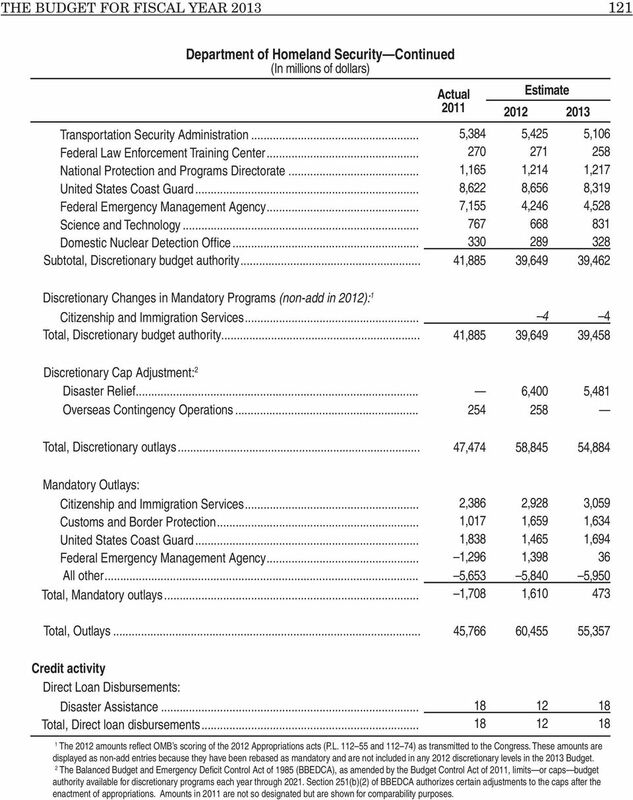 These amounts are displayed as non-add entries because they have been rebased as mandatory and are not included in any 2012 discretionary levels in the 2013 Budget. 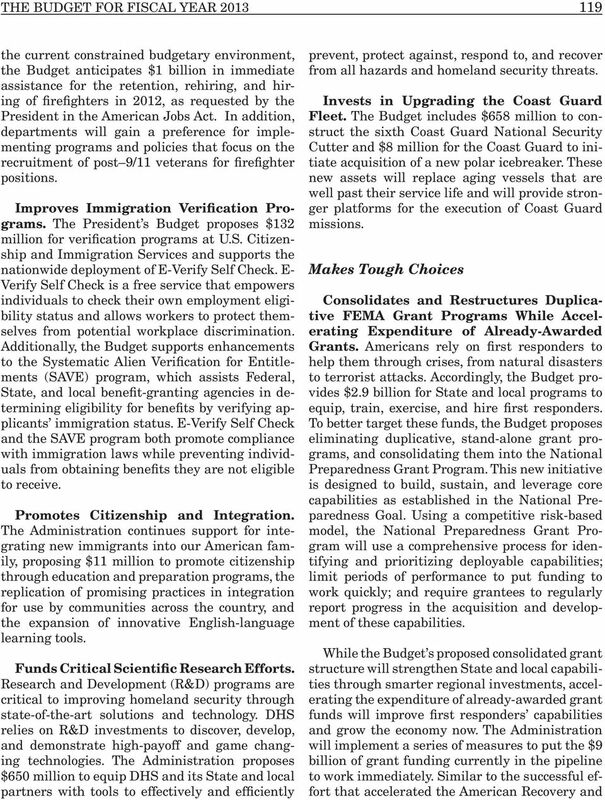 2 The Balanced Budget and Emergency Deficit Control Act of 1985 (BBEDCA), as amended by the Budget Control Act of 2011, limits or caps budget authority available for discretionary programs each year through Section 251(b)(2) of BBEDCA authorizes certain adjustments to the caps after the enactment of appropriations. Amounts in 2011 are not so designated but are shown for comparability purposes. DEPARTMENT OF LABOR. Introduces bold reforms to strengthen Job Corps by improving its outcomes and costeffectiveness. 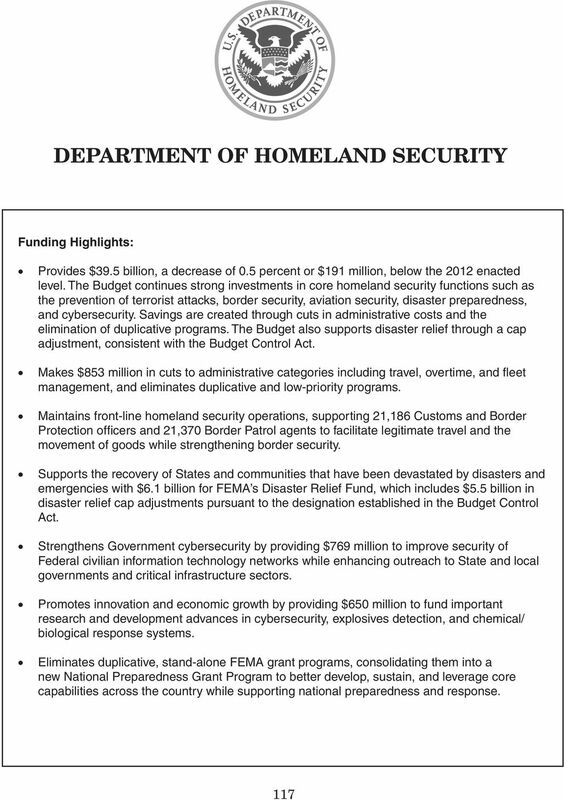 FUNDING FOR DEFENSE, HOMELAND SECURITY AND COMBATING TERRORISM SINCE 9-11: WHERE HAS ALL THE MONEY GONE? JOB ANNOUNCEMENT. Chief Security Officer, Cheniere Energy, Inc.
DEPARTMENT OF HOMELAND SECURITY Washington, DC 20528 Phone, 202 282 8000. 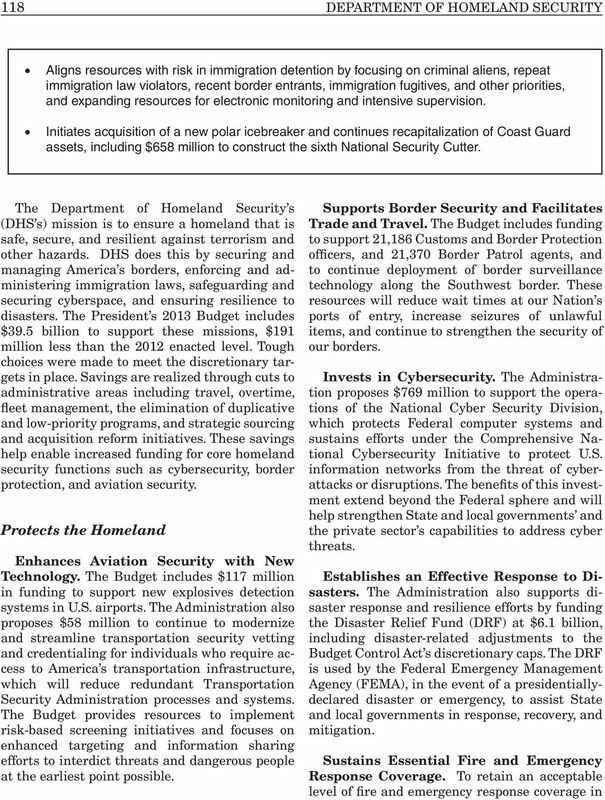 Internet, www.dhs.gov.